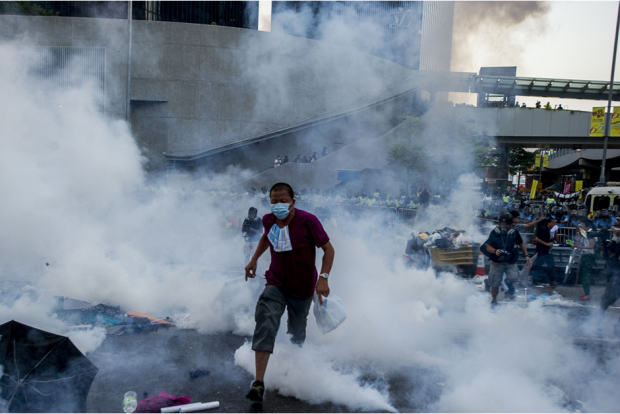 A pro-democracy demonstrator runs as police fired tear gas towards protesters near the Hong Kong government headquarters on September 28, 2014. Police fired tear gas as tens of thousands of pro-democracy demonstrators brought parts of central Hong Kong to a standstill on September 28, in a dramatic escalation of protests that have gripped the semi-autonomous Chinese city for days. Fu Hualing is a professor in the Faculty of Law at the University of Hong Kong. He teaches and researches constitutional law and criminal law with a focus on China. The Hong Kong protests have just entered their third act, with C.Y. Leung, the Chief Executive, announcing minutes before a deadline set by student protestors, that the government would meet the main protest organizers “to discuss constitutional developments.” While Leung’s announcement defuses the risks of an immediate escalation of the confrontation, it is not clear if the government is genuinely motivated by a desire to find common ground with the protestors, or is instead employing a delay tactic in the hope that the momement peters out. I, personally, have few doubts that the leadership in Beijing would have little hesitation in using lethal force against its own people if they felt the Chinese Communist Party’s grip on power was slipping. But the current situation in Hong Kong is still a long way from that crossroads, and the fact that the Hong Kong government finally acceded the initial demand of the students—a face-to-face meeting—reflects it. The nature of the confrontation in Hong Kong is in essence a question of autonomy: how much, or how little, genuine autonomy can the territory maintain, now that it has returned under Chinese sovereignty. As Sebastian Veg notes below, the protest movement is not a frontal challenge to the Party’s monopoly on power in Mainland China, nor does it seek to challenge China’s sovereignty on the territory. But a hardline response from the authorities could change that. Around the world, tensions between actual or nominal autonomous territories and their respective sovereign power about the extent they are allowed to self-govern are part and parcel of any autonomy arrangement that has—for historical or cultural reasons—come into being. Hong Kong is no different. At the moment, the student-led protest movement is voicing a very simple, compelling demand: that Hong Kong be granted what it has been promised, “a high degree of autonomy,” “no change for fifty years,” and “one country two systems.” But since the handover in 1997 the Hong Kong government has failed to do what the Communist Party in China has been so adept at since the bloody suppression of the 1989 democracy movement: respond to social demands before their turn into political ones. As a result, long accumulated frustrations about local governance in Hong Kong—including trying to keep Mainland China authoritarianism and utter disrespect for the rule of law—have crystalized into demands for something that Beijing never intended to give to its Special Administrative Region: genuine democracy. Precisely because the majority of the Hong Kong public understands that the prospect of a one-party dictatorship granting democracy to a segment of its population is close to nil, it is not clear that the center of gravity of public sentiment overlaps with the demands of the students and Occupy Central. It could then move to the next item on the Basic Law: the dreaded Article 23 anti-subversion law, which would almost certainly result in a dramatic decrease of political and civil liberties as well as freedom of information in the territory. This will be at the back of the mind of the protest organizers as they meet with the government’s number two, Carrie Lam. But so it should be for C.Y. Leung himself: In 2003, facing a million-strong demonstration to oppose the passage of Article 23 anti-subversion legislation, then-Chief Executive Tung Chee-hwa adamantly said he would not resign. One year later, he was gone. For now, the authorities in Beijing and Hong Kong are betting that they can wait out the demonstrators, counting on support among the general public to fade. Beijing could have its way, and C.Y Leung save his seat. Much will depend on how the protesters can maintain the momentum, presumably by uniting around one popular demand: that C.Y. Leung steps down. Whatever the result, the Hong Kong public will have demonstrated once more that their determination and courage to defend what we in the West take for granted: civil liberties and the rule of law. It’s regrettable that discussions of the Hong Kong civil protest movement have focused on its possible repression before even trying to understand what the movement is about. For all these reasons, democrats in Hong Kong worry that the Hong Kong government is willing to erode the rule of law in Hong Kong to achieve its own short-term political aims. A group of idealistic academics and activists set up a group called Occupy Central in 2013 with the aim of fighting for full democracy through civil disobedience. Despite terribly mismanaging their timetable, their message, and their PR strategy, they twice profited from a backlash in public opinion: the first was when the Beijing White Paper was published just days before a mock-poll in June 2014 on election reform and 800,000 came out to vote. The second was when the National People’s Congress handed down a highly restrictive framework for electoral reform on August 31. Stepping beyond the Basic Law framework, it tried to set limits on numbers of candidates and minute details of the nomination process. Student and other groups then staged a massive spontaneous movement in late September which Occupy was able to join (rather than lead). The government attempted to nip the protests in the bud by arresting student leaders and ordering the use of tear gas against protesters, but a High Court judge ordered their release on a habeas corpus writ and the police forces backed down from the confrontation. So what is this movement about? Of course it is about more democracy in Hong Kong, as promised in the Basic Law framework. It does not, at this stage, contain any open challenge to the Party’s authority in Beijing, or over China’s sovereignty in Hong Kong, and this should be acknowledged more clearly by the international media. More deeply, it is not a movement about China: it comes at the end of a decade of civil awakening and intellectual decolonization in Hong Kong, which has discovered its own identity. With its strong utopian streak feeding the carnival-like atmosphere in the streets, it is changing the way people think about their city. Public opinion, however, remains divided and the battle over hearts and minds continues. If the Chief Executive is willing to be an honest broker between Hongkongers and the Beijing authorities, or if he steps aside and someone else takes on this role, the crisis can still be resolved. The consultation process on election reform can be relaunched, for example by implicating the Basic Law committee. But while the protests leaders have demonstrated undeniable leadership in their rational and principled statements, these qualities remain worryingly elusive on the government side. No one who lived through China in 1989 emerged unscarred. Beijing residents learned their government and army would do anything to keep the Communist Party in power. Hong Kongers learned that their post-colonial future suddenly looked more ominous. Journalists, like myself, learned to mistrust deeply the momentum of joyous outpourings of youth-led demonstrations—like we are seeing in the streets of Hong Kong today—because we saw the joy turn to horror overnight. The Communist Party leadership learned … Well, what did they learn? That is the key question facing Hong Kong today, and one for which we don’t have an absolutely clear answer. All public indications are that the lesson the leadership learned was that army intervention was a success, that the deaths bought needed stability, that world condemnation would quickly pass. If those indeed were the lessons, then my anxiety and pessimism about how the Umbrella Revolution will play out is more than justified. But what if the leadership, too, was scarred by Tiananmen? What if the army found the cost of killing its own people was too high? Then, perhaps, there may be some constructive ways through. However, since coming to power, Chinese President Xi Jinping has shown no signs of compromise on any issue. He has cracked down on domestic opponents ruthlessly. He seems intent on using and displaying power. And he would seem to have everything to lose and nothing to gain domestically by appearing soft on dissent in Hong Kong or, worse, soft on sovereignty. Worringly, too, one key group in the Hong Kong drama was not scarred by Tiananmen. The secondary and university students who have been in the vanguard of Hong Kong’s protests and whose idealism galvanized the city were not even born when a previous generation of students saw their dreams crushed under tank treads. The generational gap both gives them courage and puts them hugely at risk. I hope for a peaceful end to the standoff. I fear a crackdown. No matter which actually happens, a generation has been politicized, a city has found a consciousness, and Hong Kong has displayed an identity separate and distinct from its colonial past and its Chinese nationality. That in itself is a huge change, a tremendous accomplishment, and a factor Beijing and the world will have to acknowledge. As Hong Kong’s “umbrella revolution” enters its sixth day and protesters are digging in for a long fight, my mainland friends remain puzzled about the protest. On hearing my explanations, they are quick to question whether it is all worth the while. For them, Hong Kong is the envy of China and it is the dream of many in the mainland to come over to study, to do business, and to raise their families. Hong Kong is well-known for its prosperity, freedom, and, above all, its rule of law. What it misses, as I explain to my mainland friends, is an icing of democracy: the ability to choose its own political leaders. Compared with societies that have undergone color revolutions in the past decades, Hong Kong remains a unique place. For the protesters, and people here in general, the battle has been fought mainly to keep what they have already had. The icing of democracy has been sought after not to achieve new freedom but to secure the freedom in existence and potentially at risk. Seen from this perspective, the stake for Hong Kong in this fight is extremely high: people may not get the icing, and they may see their cake vanish quickly. The majority of the residents in the city, knowing what the People's Liberation Army is capable of, would sooner or later realize and accept the political reality. In the end, pragmatism will prevail after protesters have made the statement that needs to be made. But there is a decent life to go on with, and there will be another battle to fight in the bumpy road ahead. Beijing has to learn to govern Hong Kong differently than it does mainland precisely because of Hong Kong’s uniqueness. Indeed, for Beijing, Hong Kong remains uncharted water in many fundamental aspects. Notwithstanding China’s political and economic power, it proves extremely difficult and costly, if possible at all, for Beijing to censor the media, to clamp down on the civil society, and to dictate the judiciary as the authoritarian government does in the mainland. The Communist Party has yet to master the art of governing a free society. The Communist Party may not have the will to force Hong Kong to become just another mainland city. The Communist elites also treasure Hong Kong for what it is for both private and public reasons. Privately it is hard to imagine which powerful families within the Party do not have some direct interest in Hong Kong. Interestingly, it is Hong Kong’s freedom that has attracted them to settle there after 1997 and it is Hong Kong’s rule of law that offers a much-needed insurance for their vested interests. Publicly, Hong Kong offers, and is seen by many political elites in China as offering, a model for China’s future. Unless that model poses an existential threat for the Party, the Party is prepared to tolerate any inconvenience that Hong Kong may cause. While the world’s media is focused on Hong Kong and the newly minted “umbrella revolution,” for decision makers in Beijing, it has much wider implications. How the leadership in China reacts to demands by the occupation of key urban centers of Hong Kong will not be defined by the geography or political atmosphere of this former British colony. For the students, it may be about their future and destiny. For Beijing, it is about a precedent for the rest of China. If one understands that Beijing’s decision has far greater ripple effects on its own subjects, especially autonomous regions on the fringes of China, such as Xinjiang and Tibet, the communist government’s baseline and determination cannot be tested, or undermined, by civil disobedience in Hong Kong. With this in mind, one can almost predict the outcome if the situation should become even more adverse. Young people often act before assessing consequences, or all foreseeable outcomes. Hong Kong enjoyed a high degree of freedom and prosperity during British as well as post-British rule, in no small part due to a “hands-off” policy by China. Democracy has no place, not yet at least, in bringing Hong Kong to where it is today. Some of Asia’s largest democracies can be seen as cases in point in mirroring another approach. No one would doubt China’s resolve if it were determined to take full control of the colony, before or now, though that would come at the cost of Hong Kong’s prosperity and an exodus by all sectors of society. China understands this perfectly well, which has been to the good fortune of those of us who have lived with relative stability, even if we might harbor more immediate frustration over social disparities. For young idealists to favor more democracy and self-determination is not unique to Hong Kong: this sentiment exists throughout the world. But to challenge a well-established authority like China without calculating the ultimate cost and unlikely chances of winning can be extremely dangerous. Hong Kong stands to lose much more than what it has taken decades to achieve. The following post also appeared in China-US Focus. The Standing Committee of the National People’s Congress (NPC) in its recent decision has sketched out a broad framework for the election of the Chief Executive (CE) of the Hong Kong Special Administrative Region (HKSAR) by universal suffrage in 2017. Many among us are disappointed that the framework is not as open and flexible as one may have wished. However, the outcome was not totally unexpected, given that any arrangements made for the election of the CE by universal suffrage must comply with the legal requirements of the Hong Kong Basic Law. Whatever shortcomings that the NPC-approved framework may have, it is still an important step forward. The alternative is to continue the election of the CE by the Election Committee in 2017, which no one wants to see happen. The NPC Standing Committee Decision has actually not specified the details of implementation, leaving plenty of decisions to be made and work to be done locally, before universal suffrage can be implemented and realized. After all, “the devil is in the details.” It is therefore time for the people of Hong Kong, regardless of their political persuasion, to put aside their differences and work together to make the election of the CE of the HKSAR by universal suffrage a reality in 2017. There is little time to waste as there are three more steps to go before the election of the CE by universal suffrage can take place and each step will take time. The NPC Standing Committee Decision is supposed to apply to the CE elections by universal suffrage in Hong Kong beginning with 2017. However, if the CE election by universal suffrage fails to be implemented in 2017, it will be necessary to start the five-step process all over again to make possible the CE election by universal suffrage in 2022. It does not appear that waiting until 2022 to implement the CE election by universal suffrage will necessarily improve the terms, since, in particular, it will depend on the prevailing conditions then. If we fail to take advantage of this opportunity to implement universal suffrage in 2017, not only will we continue with the existing Election Committee system, but we shall further delay the introduction of the election of the Legislative Council (LegCo) by universal suffrage to 2024 or beyond. This is definitely the time to move forward. The NPC Decision specifies that the size and composition of the CE Nominating Committee and the method of selection of its members should essentially follow the principles and practices of the existing Election Committee. This means major changes are not likely to be possible for the 2017 CE election. However, marginal changes are still possible, for example, the abolition of corporate voting in some of the functional constituencies. In the future, looking beyond 2017, one of the ways in which the composition of the Nominating Committee may change gradually is when more and more of its ex-officio members—for example, the members of the LegCo and the District Councils—are elected by universal suffrage. It makes practical sense and is probably the easiest way to achieve a consensus among us to maintain the requirement of open endorsement by at least one-eighth of the members of the Nominating Committee, analogous to the requirement of the existing Election Committee, for a person to become a nominee as a candidate for the CE. Each member of the Nominating Committee can openly endorse only one nominee, but is not required to endorse any. This will mean that, in principle, it is possible to have up to eight nominees before the Nominating Committee, which will then select from among them by democratic procedures two to three CE candidates for election by universal suffrage. In actual practice, it is unlikely to have eight nominees but certainly possible to have more than three nominees, including at least one nominee supported by the Pan-Democrats. If a ceiling is imposed on the total number of endorsements that a nominee can round up, say, also at one-eighth of the membership of the Nominating Committee, it is likely to lead to more nominees. Analogous to the voting procedure of the Election Committee, voting of the Nominating Committee on the nominees should be conducted by secret ballots. Each nominee will come up for a vote by the entire membership of the Nominating Committee. He or she must obtain more than half of the votes of the members of the Nominating Committee (say, 601 affirmative votes based on a Nominating Committee of 1,200 members) to become a CE candidate. However, in the event that more than three nominees have received more than half of the votes, which is a possible outcome given the proposed threshold of endorsement by one-eighth of the members for a person to become a nominee, the three nominees with the highest number of affirmative votes will become the CE candidates. It is possible at some future date that the restriction of up to three CE candidates may be relaxed as the total number of CE candidates will always be limited by the threshold required for becoming a nominee. Also, under this system, there is no a priori reason why a nominee supported by the Pan-Democrats cannot become one of the candidates if the platform of this person is sufficiently appealing and credible. The election of the CE by universal suffrage, with the candidates selected by a Nominating Committee, will be quite competitive. This is because the candidates will have to compete for the votes from among more than five million eligible voters. We may recall how competitive the last CE election turned out to be within the Election Committee, even though only 1,200 people had the vote. Election of the CE by universal suffrage will be many times more competitive as the candidates try to differentiate their respective platforms to compete for the votes of the electorate. For a voter, even if his or her ideal nominee fails to become a CE candidate, he or she will still have the chance of voting for a candidate with the closest similarity to his or her ideal candidate in terms of ideology and platform. The vote of every person will count. The Election Committee has in the past followed a rule that requires the winner of an election for the CE to receive the affirmative votes of more than half of its members, that is, 601 out of 1,200. We believe this is a good principle that should be extended to require that the CE elected by universal suffrage must also receive half of the total votes cast in that election (including valid ballots in which the voters abstain from voting for any of the candidates, in effect, voting for “none of the above”). Thus, for example, if there were three candidates, and none of them receive more than half of the total votes cast, there will be a run-off election between the candidates with the two highest numbers of votes. The run-off election is a standard arrangement in many countries. For example, in France the chief executive or president is directly elected by universal suffrage. The purpose of a run-off election is to guard against the possibility of a fringe or extremist candidate being elected under a “first-past-the-post” rule, which may not be in the best interests of the vast majority of the people in the country or region. Moreover, it also ensures that whoever ultimately wins the election will have had the opportunity to modify his or her platform before the run-off election to better reflect the mainstream aspirations and views of the electorate so as to attract the votes of voters who have not voted for him or her in the first round. In any case, it will help ensure that the winner of the election will not have extreme positions on either end of the political spectrum. A notable exception to the run-off arrangement is the presidential election in Taiwan, in which the “first-past-the-post” rule is used. Under this rule, in the case of three candidates, the one with 34 percent of the votes cast will become the winner if the other two candidates receive 33 percent each of the votes cast. This is similar to the situation in the 2000 election in Taiwan, in which Chen Shuibian won the election with less than 40 percent of the total votes cast. If there had been a run-off election between Chen and James Soong, the candidate with the second highest vote, Chen would probably not have been elected. Thus, it is important for Hong Kong to be prepared to have a run-off election if necessary. If nothing else it would enable the elected CE to have a reasonable claim of a mandate from the voters. In a run-off election, or in an election with only two candidates, if neither of the candidates have platforms that are attractive enough, it is possible that neither one wins more than half of the total votes cast, including valid ballots of abstention. In that case, it will be necessary to start the entire nomination and election process all over again. The Nomination Committee will have to be reconvened to select new candidates for a new election. Thus, ultimately, the electorate can still have the power to reject truly unpopular candidates. However, since it is not in anyone’s interests to have a “hung” CE election, the Nominating Committee must exercise due care in its selection of the candidates so as to avoid this possibility. If we reject a half-full glass as a half-empty glass, the glass will remain empty. If we accept a half-full glass, there is the possibility that it may become fuller in time. No electoral system in the World is perfect, including that of the United States, especially at the very beginning. Let us take the first step in making the half-full glass fuller! Let us move forward on election of the CE by universal suffrage in 2017! —Lawrence J. Lau is an economist and Ayesha Macpherson Lau is a certified public accountant. The opinions expressed herein are entirely their own and do not necessarily reflect the views of the organizations with which they are affiliated. This post also appeared in China-US Focus. 1. That Occupy quickly became the Umbrella Revolution has to do with the way the CCP has repeatedly angered Hong Kongers. From the White Paper of June 10th to the decision on August 31st; to the Hong Kong government’s sudden cancellation of scheduled talks—the effects of these retrograde moves have had a greater mobilizing effect than anything Hong Kong’s political activists have done. 2. The democracy movement itself has been brewing for a long time. Along with enormous potential, it carries the social experience of Hong Kongers: both their individual and collective memories of grievances. It carries the blood flowing from wounds; the poetic grace of the revolution and the community’s imagination of the future. All of these things seethe with vitality; and together, they are now bursting forth. In another respect, the movement reflects the characteristics of the Information Age and what we call Web 2.0: decentralization of organizing methods; the timely dissemination of information coming from the Internet and other media; and the pooling of information by both those present and those who aren’t. A multiplicity of leaders is combined with public will; organized action combines with spontaneous action; and the element of planning in the actions has combined with a willingness to follow trial-and-error at a moment’s notice. This kind of open, decentralized, and flexible social movement—which respects public opinion and inspires creativity is the very thing that is valuable and fascinating about liberal democracy. All of these things affect where the movement is headed and the possibility that it will bear fruit. 3. Both the protesters and the Communist government have very limited room for compromise. It’s easy to imagine the movement will have a rough ending, and the possibility of a violent escalation still exists. But regardless of how the Hong Kong democracy movement is suppressed, it will continue to present a stalemate. Hong Kong’s society will be torn a little more. If the municipal government fails to cooperate with the movement, the citizens’ non-cooperation movement will grow and acts of disobedience will become more frequent. Both the movement and the resistance that follows it will produce far-reaching effects on Hong Kong’s political ecology, its social psychology, its economy and finance and its relationship with China.